Click here for youtube link to Joy Kills Sorrow. “This young, five-piece band that hails from Boston was one of the most impressive groups at this year’s Savannah Music Festival. Jacob Jolliff, the 2012 national mandolin champion, was a bandit single-handedly stealing the show with several brilliant solos while playing in front of a packed house on Thursday. ”JKS is fronted by Emma Beaton, a fiery-haired, charismatic and intensely evocative singer with soul way beyond her years (only 22!). Her delivery combines Ella Fitzgerald, Janis Joplin and Adele, if you can believe that. This is one of those bands, however, where the vocalist is able to shine precisely because of the enormous skill of the band; as good as Beaton is, you get the sense that they lift her on their shoulders. “True ensemble playing – the sublimation of egos to a sound that’s beyond individuals – as on this album, is exhilarating. This is the second release by Boston-based Joy Kills Sorrow, the first with a significantly new line-up. They were mesmerizing in their eponymous first recording, but here JKS has found its voice – a band voice. Their name comes from the ’30s radio station where the Monroe Brothers performed (WJKS – Where Joy Kills Sorrow) – and that’s cool. 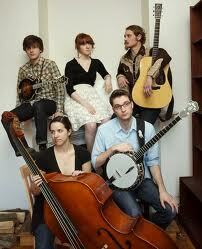 They play guitar, banjo, mandolin and bass – and that’s cool, too. But the coolest thing of all is that they tell the truth. This is fresh stuff. Americana is rife with posers, but JKS is the real thing – talented musicians and singers giving it all they’ve got."